The latest from Zeyek tells the story of the Hordika in an alternate reality. Technically it does start with the Toa Metru and quickly breeze through their Toa Hordika phase, but it really focuses on the fully-devolved Hordika who are no longer Toa in any way. Haven't you ever wondered what real Hordika would look like? 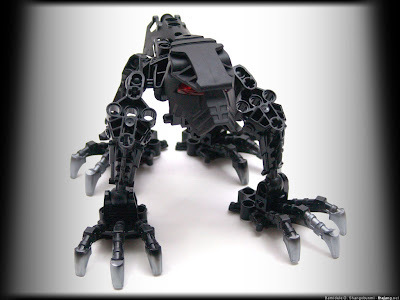 There was an official LEGO fully-mutated Hordika Dark Hunter built by a fan, but I don't at all agree with the direction he took it. 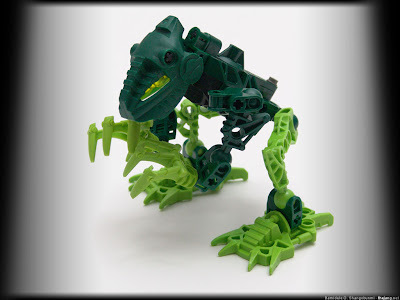 From proud upright humanoid Toa Metru, the mutation seen in Web of Shadows takes our heros to a shorter, slouched-over form that clearly suggests that they're mutating into 4-legged animals. With my Hordika MOCs I just tried to follow the progression to a natural end. To let you in on a little secret, this whole mini-project came about because I had way too many large claws and wanted to figure out a way to use up a lot of them at once by inventing a claw-bearing species! I guess it worked, because I used up 24 claws. I still have too many extras, but at least now I can close my "feet" drawer a little more easily. I don't recall how or why I came up with the idea of Great Hordika, but I was really happy with how Vakama turned out. Great Hordika Onewa was the last of the series that I did, and I think the body is a pretty decent up-scaling of the original, but I feel like the head is way too small on the enlarged body, especially viewed from any front quarter. Can't win 'em all I guess! At least it's not so bad from this angle though. Have you heard the story of the Hordika? Be not quick to answer, when you may not understand the question. 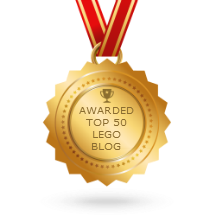 I speak not of the Toa Hordika. I speak of the actual, rahi, Hordika. 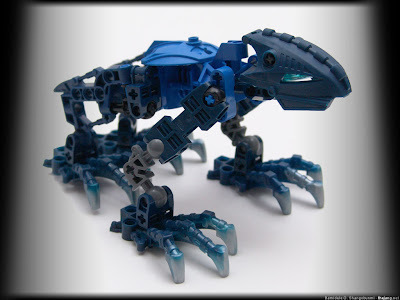 You see, there exists a reality in which the Toa fought on the side of good, but the Rahaga did not. 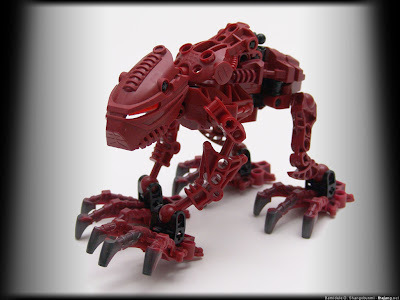 When the Toa Metru were infected upon their return to Metru Nui, the Rahaga of this reality saved & befriended them as in the more familiar story, but here, it was a trick, and a trap. The evil Rahaga led the Toa on an exceedingly long quest to find a mythical plant they claimed could counteract the Hordika venom. In reality, the plant did not exist, and the quest was merely a diversion to give the poison enough time to complete its work. The Rahaga were successful, and the Toa devolved fully into Hordika before they even began to suspect foul play. 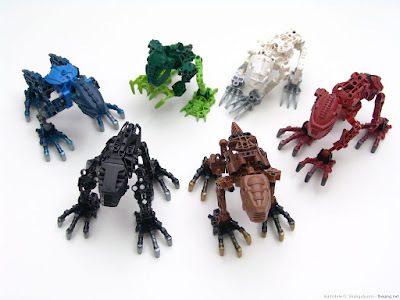 The genetic differences between the six Toa caused them to assume new unique characteristics when their transformation was completed. 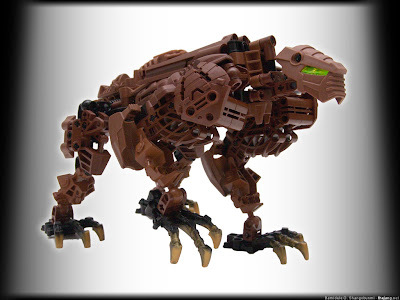 Whenua become short and stocky in his build, with strong shoulders and upper arms, but relatively weak hind legs that made him the slowest runner. Nokama grew long and sleek, able to leap great horizontal distances. Matau's transformation seemed to have stalled before it was complete, as he continued to walk primarily on two legs. He was also the most diminutive of the Hordika, and the most greedy. Nuju's new form was uninteresting, but his personality was most unusual. His nerves were shaky and he became the most passive and easily frightened of the group. 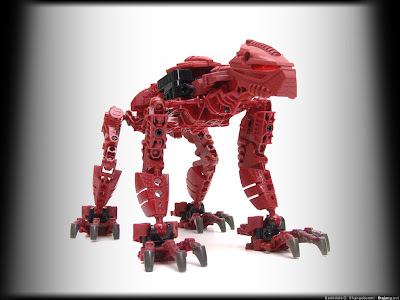 Vakama, predictably, was the most ill-tempered Hordika, prone to overreaction and fits of rage. He felt himself superior to his brethren in every way, but the deep evil & hate within him clouded his judgement and limited his ability to act on his feelings. It was Onewa, exceedingly strong of body and clear of mind, who proved to be a natural leader. 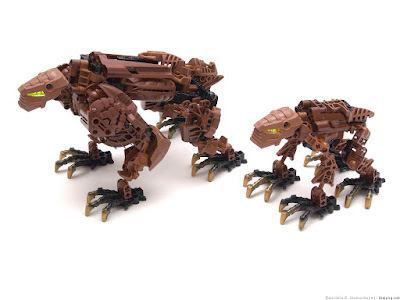 The numerous deadly Rahi that inhabited Metru Nui in its darkest days made survival difficult for any and all creatures, and the Hordika found that they were best off sticking together to find & hunt food and to defend themselves. Onewa's consistent good judgement, combined with his prowess in battle, caused him to gain strength rapidly and he could feel pure power coursing through his veins. Eventually, he was able to undergo a second transformation, becoming the very first Great Hordika. An enormous beast oozing raw physical strength, Great Hordika Onewa was not a creature to challenge, and yet, with his newfound power came no change in his demeanor. He continued to lead his fellow Hordika, but freely shared all food he gathered or caught, and demanded nothing in return but respect and loyalty. Vakama, meanwhile, grew ever more jealous of Onewa, and irritated by the others whom he saw as increasingly weak and subservient. He turned to the mischievous Rahaga Iruini for solace. 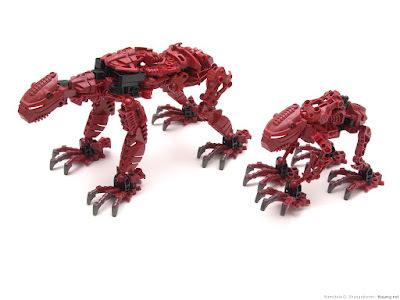 In private meetings they mocked the other Hordika and fantasized of a day when the others would be but obedient slaves to the clearly superior and more capable Vakama. Over time, the tone of these conversations became more serious, and the two actually began to devise a plan to turn Vakama's dream into a reality. Over the following year, Vakama pretended to slowly acquiesce to Onewa's leadership and even began doing favors for the Great Hordika such as bringing him his favorite fruit. Into one of these delicious treats, Iruini secretly injected a mutated form of the Hordika venom. Upon injesting it, Onewa quickly felt a new surge of energy as the venom briefly boosted his strength as it took hold. Not long later, though, he started to become terribly disoriented, and he instructed the group to rest at a camp while he broke ranks to collect himself alone where the others would not witness his wavering condition. Vakama quietly followed a safe distance behind. Onewa became increasingly concerned about what was happening to him, and his walk turned into a frustrated jog. His eyesight began to fail and he crashed and tripped through bushes and vines, eventually collapsing to the ground in a small clearing. This is when Vakama revealed himself and what he had done. 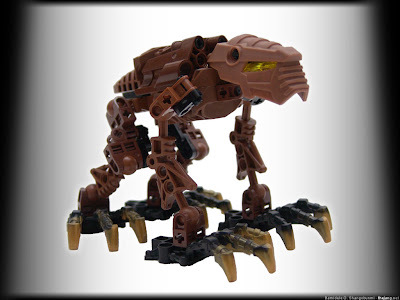 Onewa summoned the strength to come to his feet and angrily charge after the treacherous Vakama, but nearly blind and with weakening joints, he couldn't mount any form of effective attack. Vakama merely sidestepped and smiled before pouncing visciously upon his poisoned victim, brutally assaulting him and bringing him to within an inch of his life. 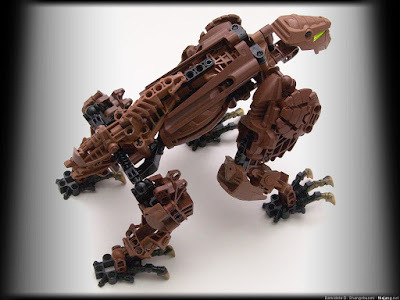 Standing over the head of the defeated and nearly lifeless Onewa, Vakama himself underwent the dramatic transformation into a Great Hordika, while Onewa simultaneously shrunk back to normal size. Onewa would actually recover from his physical injuries, but the mutated venom left him blind and simple-minded. From then on, the heartless Vakama would subjugate the Hordika and lead them with an iron fist, or should I say, four iron claws.